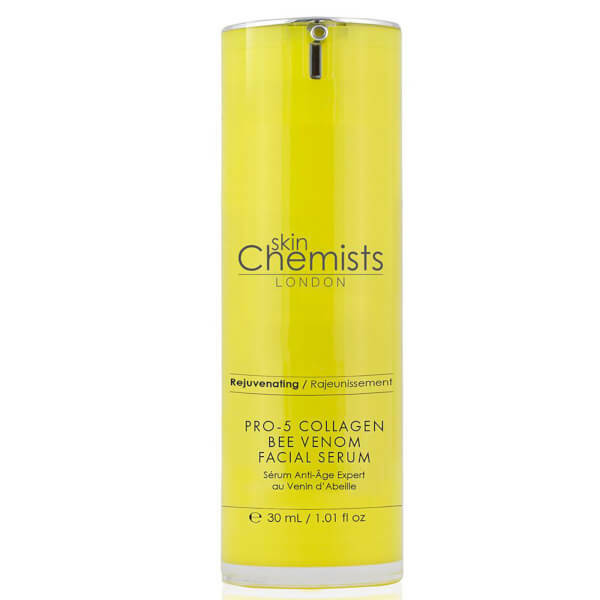 Achieve a smoother, more refined complexion with the skinChemists London Pro-5 Collagen Bee Venom Facial Serum; an innovative, antioxidant-rich formula that delivers multiple benefits. 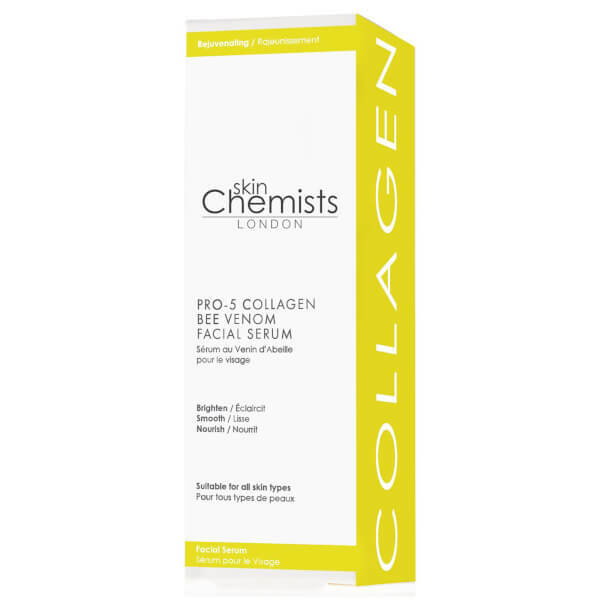 Infused with Bee Venom, an ingredient that mimics the after effects of a bee sting to promote a firmer, more plumped appearance. 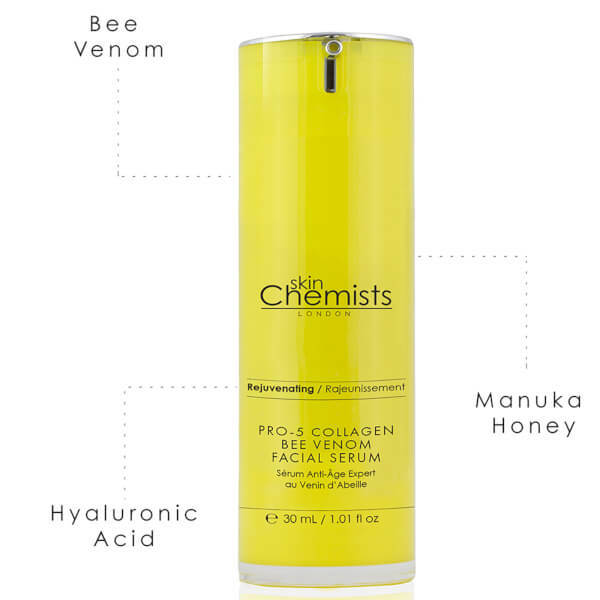 Synergising Manuka Honey and Hyaluronic Acid, the quick-absorbing serum hydrates and rejuvenates skin, whilst helping to minimise the appearance of fine lines, wrinkles and uneven tone. 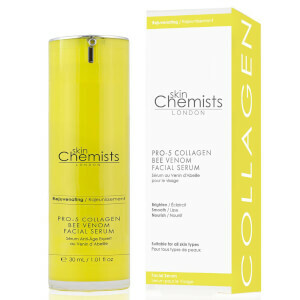 Defends against environmental aggressors and inspires a radiant, youthful-looking complexion with a lifted effect. Aqua (Water), Alcohol Denat. (SD Alcohol 1-Methylhydantoine-2-imide, Triethalolamine, Carbomer, Mel (Honey), Glycerin, Bee Venom, Benzyl, Alcohol, PEG-7 Glyceryl Cocoate, Allantoin, Phenoxyethanol Sodium Hyaluronate, Disodium EDTA, Dehydroacetic Acid, Parfum (Fragrance), Ethylhexylglycerin, Benzyl Salicylate, Hexyl Cinnamal, Sodium Benzoate, Limonene, Aloe Barbadensis Leaf Extract, Potassium Sorbate.